News > Underground News > DFW’s “Adopt-A-Family” Xmas Charity Show Announced! DFW’s “Adopt-A-Family” Xmas Charity Show Announced! 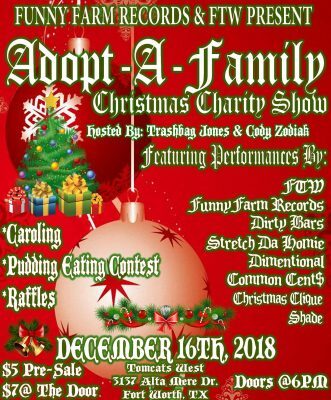 Our homie Nyro from Funny Farm Records has collaborated with DFW’s own FTW to put together an Adopt-A-Family Christmas Charity Show! There will also be Caroling, Raffles and even a pudding eating contest! The show will be hosted by Trashbag Jones and Cody Zodiak. The cost to get in is only $5.00 in advance, or $7.00 at the door. ALL proceeds will go towards getting Xmas gifts for families in need. Make sure you show up, have a great time with your homies, and feel good about helping some of those who are less fortunate. ALL YOU JUGGALO OPENING ACTS WITH WACK RAP NAMES..
YOU WILL NO LONGER BE LAUGHED AT ON THESE FLYERS! WAY TO HELP OUT THO YO!